Sunday's lectionary gospel reading (in the Church of England at least) was the story of the Wedding at Cana and Jesus turning Water into Wine. In the CofE's lectionary it is one of the few passages from Jesus' ministry to appear every year, and so it's perhaps not surprising that it occurs in a good number of Jesus films. What's interesting about the various portrayals is that, particularly in the later films, the filmmakers tend to take the opportunity to stress the otherness of Jesus' culture from our own. On occasion, however, this clashes with the film's overall portrayal of Jesus. It's somewhat jarring to see a blond-haired Jesus at a more typically middle-eastern wedding. As is typical of this film, it prevents the action in a very straightforward manner. Jesus and his mother sit prominently at the front of the action, though the film's static camera, which frames the whole scene as if the audience is watching the action in a theatre, means that it's very much Jesus that is centre stage. The stone jars filled with wine are tiny - certainly not capable of holding 20-30 gallons. In contrast to the narrative where only the servants see what he is doing, here Jesus gestures to those at the back to get them to stand and see the action as if he's performing in a magic show. It's 100 years since Robert Henderson-Bland's Jesus came to our screens. 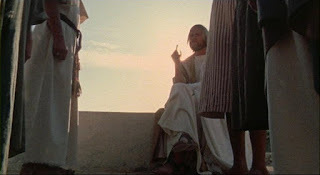 In contrast to several portrayals this is not Jesus' first miracle, and it's one of the film's weaker moments. As with the above the miracle is performed somewhat theatrically and in full view of the guests. The chief steward is still surprised, but not so much because of an apparent breach of protocol. One notable innovation in this scene is that at the moment Jesus performs the miracle a light from above shines on his face. The Judean Story, as director D.W. Griffiths called it, is the shortest of the four and is pure propaganda. The film as a whole is essentially campaigning against the temperance movement, showing the damage intolerance and its perpetrators have caused down the centuries. But it's the Jesus story where this intolerance coincides most closely with Griffith's biggest concern. In one intertitle he describes those objecting as "meddlers then as now". In another he adds a footnote explaining that "Wine was deemed a fit offering to God; the drinking of it a part of the Jewish religion". Not dissimilarly to Olcott's portrayal as Jesus conducts the miracle a cross shadow falls across him, only whereas the 1912 film used it to suggest divine approval, here it foreshadows Jesus' demise at the hands of intolerant humans. It would be over fifty years until this episode from the gospels was portrayed in the cinema, and when it came it was at the hands of one well acquainted with the pleasures and problems of alcohol. Johnny Cash's music provided the soundtrack for Robert Elfstrom to direct himself as Jesus. The scene has the surreal dreamy quality typical of much of the film which here reflects Cash's description of this episode as a parable (as some commentators think). The wedding itself is very sparsely attended, and it's here that there's the greatest clash between the ultra blond Jesus and the effusive middle-eastern dancing. There's also a man smoking a hookah (water pipe) off to the side. Mary seems to be absent in this portrayal, although the camera does linger on a couple of women's faces as it becomes apparent that the wine has run out. Cash pipes up with his song "He turned the water into wine". A handful of particularly nice shots later (of the water being poured out and then changing colour) and Jesus has saved the day. This is one of the best scenes in the film, particularly because of the emphasis on the story's cultural context. Whilst, as noted above, this is fairly common for this episode, Scorsese nails it far more effectively than most of the other directors, despite Dafoe's blond locks. The film also showed Jesus dancing, something absent previously but that most of the subsequent films would include, as well as a moment of levity as the miracle is performed. Nathanael, who has invited his new friends to the wedding, is convinced that the stone jars only contain water. Jesus is casual and playfully asks what's in the jars, before gently insisting that it's wine rather than water, and then raising a glass to his stupefied new disciple. Again Mary is absent, though Magdalene attends. When her attendance is challenged early on, Jesus uses the opportunity to talk about his father's feat where everyone is invited. In many ways Last Temptation is one of the foremost inspirations for Young's Jesus, using some of it's edginess, such as showing Jesus dancing at the wedding, whilst sanding down Scorsese/Kazantzakis's more controversial edges. This scene borrows heavily from Scorsese's, but adds in Mary, portraying her as a somewhat pushy mother catapulting her slacker son into messiahship (the moment Mary the mother of Jesus births the Christ one might say). Jesus is keen to stress that he's not ready, but for Andrew and John, who are having doubts, its the moment that they become convinced he is "the one". Eventually fed up with his reluctance ("My hour has not yet come") she lectures him ("it is time, for Andrew and for John") before forcing his hand telling a nearby servant "Jesus will help you with the wine". She ends by bossing poor Andrew around as well :"Drink Andrew, the cup you desired is here...He is the one Andrew. Have no fear in following him". The use of "he is the one" seems somewhat comical after The Matrix, but it's hardly the film's fault that it happened to be released the same year as one of the most talked about films of the decade. Also released at the same time as The Matrix was the hilariously bad The Revolutionary. It also has a Jesus who dances, but here in contrast to the exuberance of Sisto and Dafoe, Jesus dances like a creep trying to hit on all the girls. When it becomes clear that the wine has run out Mary (who looks about the same age as Jesus) begs "please they'll be disgraced", whilst the hostess laments "How could this happen? I can't believe it". All of which at least provides a bit of cultural commentary about the severity of such a shortage. The scene is overshadowed however by the ridiculously snobby steward "you can't be serious" and his 'dramatic' change of heart - "This is the best wine I have ever tasted". This exaggeration of the text reflects the common interpretation that this 'sign' is about the wine of Christianity replacing the water of Judaism. Also released in 1999 was Mary, Mother of Jesus. The film makes a few interesting references in this scene. Firstly that the wedding in question is that of Jesus' cousin Joses, reflecting the Catholic interpretation that the brothers of Jesus named were actually his cousins (the precise meaning of the Greek word here is disputed). Secondly Mary Magdalene and Mary, mother of Jesus discuss Peter's view that women shouldn't "be allowed to follow the master". Mary asks Magdala what Jesus said: "that women are fit to guide becuase they raise our sons". It's difficult to know what to make of this. Directing Peter's comments towards Mary Magdalene evokes the Gospel of Mary, although I'm not sure this is deliberate. But what is particularly interesting is how this relates to the issue of women priests. Peter could be read as a stand-in for the pope and, by extension, the Roman Catholic church. By getting Jesus to disagree the (Catholic) filmmakers might be offering a critique of the church's official church. But on closer inspection, Peter's words go far beyond Catholic teaching, denying the right for women even to be followers. Jesus' reply, in contrast, permits women to guide, but falls far short of condoning priesthood. After all that Saville's Gospel of John is rather unremarkable. Perhaps the most interesting aspect is the use of the Good News Version of the Bible, providing a somewhat softer response from Jesus after Mary's initial comment. It's perhaps fortunate that in a year in which I've struggled to blog regularly there's not been a great deal happening. 2010 was a quiet year; 2011 was quieter still. From the point of view of this blog, major change was the start of the Facebook page. Apologies if I've been banging one but this, but I'd urge anyone disappointed by the lack of traffic on this blog to keep an eye on things over there, even if you "don't do Facebook". 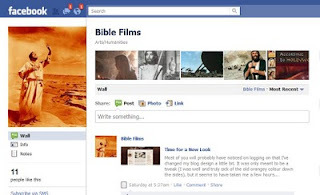 You don't have to start a Facebook account, or give them any information to read it, and all the news about new Bible films, or reviews by others on older ones is there. I'd also encourage others to keep posting and commenting. I'm particularly grateful to Peter Chattaway who frequently adds new bits and pieces, and for all the others that have contributed. Ultimatey, I guess, I started this blog as a way to resource those looking into Bible Films, and as digital communication has moved on better ways have emerged to do that. Facebook provides a less top-down approach than this blog which means that there can be more interaction between users, and a wider pool of people contributing and so on. And if you just want to read that's fine - the same stuff is over there, but in general you get it much quicker. The blog will stay for more in-depth writing such a recent posts. Despite the rumours which continue to fly about Bible films in the works (including the exciting news this year about Scott Derrickson filming Goliath) almost no new dramatic portrayals of the biblical narratives were released this year. The closest we came was the première of the midrashic Young Avraham at the Vancouver Jewish Film Festival. There was also the short film The Gathering and DVD releases of a new filmed version of Schöenberg's "Moses und Aron" and Where is my Father>, a new film about Job. Thankfully, there were at least a few documentaries to keep up the interest. The BBC gave us a three-parter The Bible's Buried Secrets presented by Exeter University's Francesca Stavrakopoulou. The first part looked at the evidence (or lack thereof) regarding David and Solomon, part 2 raised the question as to whether God had a wife, before the final part looked at the origins of the Garden of Eden myth and proposed that the original story used Eden to talk about Jerusalem. The series was interesting, although not always convincing, and managed to avoid some of the modern TV documentary clichés, but was beset by overly dramatic rhetoric about "rocking" and "shaking" the very core of monotheism. For those who felt the series was a little too one-sided in favour of atheists and liberals, the BBC, as always, redressed the balance at Easter offering a two-part documentary The Story of Jesus. Aside from such prominence being given to such a orthodox / traditional / conservative retelling of the Easter story, the programme was also notable for breaking from the standard format of having one expert narrating and interviewing others by using nine different scholars do the work on screen, occasionally meeting to hand on to the next. It also featured some good footage from Big Book Media. The only other significant occurrence was about as tangential as things can get. BBC4 broadcast a rather surreal fictionalisation of the events leading up to the release of Monty Python's Life of Brian in general and the infamous TV debate in particular. Holy Flying Circus starred Charles Edwards as Michael Palin and Darren Boyd as John Cleese as they went head to head with Malcolm Muggeridge (played by Michael Cochrane) and Mervyn Stockwood, the then Bishop of Southwark (Roy Marsden). It contained a few good laughs, but was overall rather hit and miss and its greatest contribution was perhaps giving the BBC a legitimate opportunity to air the full version of the original programme Friday Night, Saturday Morning. And that was more or less it! For the blog and me it was a year of great contrasts. The start of the year was busy with several different presentations and projects all happening within 10 days of one another at the start of the year and struggling to be able to even put metaphorical pen to non-literal paper. Whilst 2012 already has the publication of a new Bible films book to it's name (Catherine O'Brien's "Celluloid Madonna"), the popular Easter release window is looking rather unpopulated at the moment and there's precious little else on the horizon at the moment. Time will tell. In the absence of a significant Jesus film this year, the BBC version's of The Nativity remains the most recent portrayal of the events surrounding Jesus' birth. The first three half hour episodes I watched with the kids, but knowing the content was a little harsher in the final episode I watched that one alone. It's hard to really explain to a 5 year old and a three year old why "funny Joseph" as they had been calling him suddenly got scarily angry, but it speaks volumes of Andrew Buchan's performance that as an adult I could appreciate that his reaction wasn't as extreme as might be expected in the circumstances. The downsides were perhaps a little more obvious this time around. Whilst I still think this is one of the, if not the, best versions of the Nativity Story on film some of the things that make it good also rein it back from becoming great. Paramount in my thoughts here is the soap-operainess of the whole thing. On the plus side the characters are well rounded, and simply by making it a kind of soap opera a lot of the religious veneer is stripped away. It's unclear how special Mary and Joseph know they are. Weird things are happening to them, yet they are not being transported to another plain of reality - they remain the same people. But then at times it does just feel a little too like Eastenders. In a way that's no bad thing - Eastenders is a far better soap than most in the world as well as in this country - but there's nevertheless a tension between the side of me that likes to see religious fluff blown away, and the side that wants there to be some sense of gravity. Perhaps in the end it's just one or two moments that just take me out of things and make me feel I'm watching a soap opera, and, at the end of the day, I don't watch soap operas. It also feels a little over long. I'd be interested to see the film cut down to one ninety minute feature. I think it would benefit from being a little leaner. Part of the problem here is that gradually drawing the three threads alive requires each to be kept alive, but that the side stories never land as well as that of Mary and Joseph. That said some of the birthing footage would be amongst the first to go were I trying to chop half an hour out of the programme. What I do like about the final episode is the way Joseph is shown as returning to his ancestral home rather than, as is usually the case, just a random town. He still has family there, and it's there rejection of Mary, and Joseph's dislike at the way they treat her that sees the two of them stuck in a stable. Lastly the final few shots of this catch something of the otherness of this moment. Some films do it with soaring scores attempting to direct your emotions, other with lighting or dialogue. Here however, it's with quietness and humility. Suddenly it makes no sense that these Magi and these shepherds even, are on their knees worshipping a little baby. It's odd and yet there they remain rooted to the spot and aware of their own smallness in the presence of one smaller even than themselves. I know Christmas ended yesterday in the west, but as there is at least one regular reader of this blog that celebrated Christmas yesterday, I thought I might make at least one more entry in this series before moving on. In fact, there might be at least one more give the last news from Mark Goodacre). Besides I got a new Blu-Ray / up-scaling DVD player yesterday and this is is usually the first Bible film I head for in these circumstances. For a three hour film, the Nativity sequence is surprisingly short at just three and a half minutes, although, as with other entries in my series, that's excluding the slaughter of the innocents. In this film that's quite a significant point. The Nativity sequence is just a part of a much bigger prologue, which last for around 18 minutes in total. The thrust of this prologue is political and historical rather than theological. The film is big on the political context of the Romans invading and oppressing the Jews; the violent attempts to overthrow them by some; and Jesus' coming as the Prince of Peace. The Nativity scenes themselves are a bit mixed. There are a couple of astounding long shots, but the closer scenes look too obviously fake. This is made worse by the voices not being in-sync with the actor's mouths. Orson Welles narrates over a series of shots of the holy couple starting as specks in the distance and then in a wide shot and then in a mid shot. The next scene is Bethlehem which the voice notes has been "much corrupted by Rome" (again inserting the political) and Joseph struggling to find somewhere for Mary to give birth. Eventually they find the cleanest stable, not only in Bethlehem, but one suspects, the whole world. One thing that is striking is that the birth happens entirely "off camera". There's not even an establishing shot accompanied by relevant sounds or a fraught looking Joseph. The first we see of it is a remarkably perky looking Mary laying down the new born king. There's a beautiful shot of the magi following the star, one of those that relies on its movement for it's composition - I couldn't find a screen grab that captured its essence - shots like this are truly cinematic. Then it's back to the studio as the magi dismount and continue on foot to the rather twee "ah-ah-ahs" of the background chorus. Unlike the magi, the shepherds are not mentioned, but have already arrived and there's a couple of classic Nativity scenes before the scene ends in a classic pose. Interestingly this nicely composed shot bears very little relation to the reverse shot that is shown directly before it. Like other artistic interpretations of Matthew's gospel there is a certain level of parallelism between Jesus the new born king and Herod the Great. Here however things are ramped up. The scene after the stable scene is of Herod and his son who will also go on to be a king (or at least a tetrarch) in discussion with Lucius about the "King of Judea". Interestingly Herod senior almost seems to defer to his son as to the best course of action. Herod junior plays it with a straight bat, preferring to bide his time one the one hand whilst simultaneously giving tacit approval to his father's horrendous solution. Lucius objects but obeys, yet it's here that his long path to salvation begins - it seems as if this is the first time Rome's orders have ever clashed with his own morals.